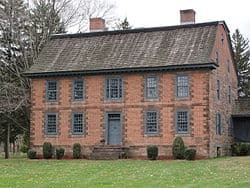 The Dey Mansion, (pronounced dye) located in modern-day Wayne, Passaic County, New Jersey, United States, and originally known as “Bloomsbury Manor,” played an integral role in the American Revolutionary War. 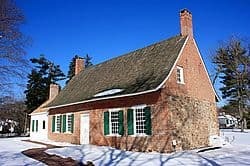 Built by Dutch settlers in the middle of the 18th century it served as Washington’s Headquarters on several occasions. George Washington stayed at the Dey Mansion during the American Revolution as one of his Headquarters. This area of the Preakness Valley was chosen because its location, as well as its abundance of food and forage in the surrounding area. On two separate occasions the Dey Mansion served as Headquarters for Washington, once from July 1 through July 28, 1780 and again from October 8 through November 27 1780. File:Washington’s_Office.JPG|Washington’s Office File:War_Room.JPG|War Room File:Washington’s_Bedroom.JPG|Washington’s Bedroom During his stay Washington and his advisers which included Alexander Hamilton, Robert H. Harrison, Tench Tilghman, David Humphreys and James McHenry used the four rooms on the eastern side of the mansion for their bedrooms as well as their military war rooms. Washington also had numerous visitors while at the Dey Mansion, those of which include the Marquis de Lafayette, General Anthony Wayne, Major General Lord Stirling, Benedict Arnold, General William Howe and the Marquis de Chastellux. Washington’s letters and correspondences during his time at the Dey Mansion totaled 964, for over 1800 written pages. One of which informed him on July 14, 1780 that the French allied support had landed at Newport, Rhode Island. Washington left on July 28 to join them. During Washington’s time away from the Dey Mansion Major, General Bendict Arnold’s treason became evident and his accomplice Major John Andre was hanged in Tappan, New York on October 2nd. Fearing that the British commander Sir Henry Clinton would seek revenge, Washington moved his army once again to the Preakness Valley’s Dey Mansion, and arrived on October 8, 1780. 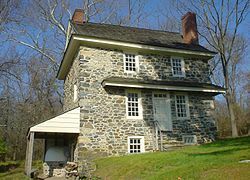 He stayed there until November 27, 1780 when he moved his headquarters and a portion of his army to Morristown, New Jersey. The Dey Mansion is of Georgian style architecture with Dutch and English influences, and was built on a 600 acre lot in Preakness Valley, now present day Wayne, NJ. The Mansion was built facing the south in order receive sunlight. Each floor of the two story mansion features a long and wide center hall with multiple rooms on each side and an attic that spans the entire length of the mansion. The kitchen is located on an extension of the mansion which is separated by a stone floor hallway. Today most of the original wood frames and floors, along with some of the original furniture and art work still exist. It sits on a two acre plot of land, with features built onto the property including a blacksmith shop, plantation house and a courtyard in the middle of the three buildings. Colonel Theunis Dey’s oldest son General Richard Dey, sold the Mansion and 335 acres of surrounding land in 1801. Since then sixteen different families have owned the mansion and land. On January 10, 1930 the Passaic County Parks Commission acquired the land, and on October 8, 1934 it was opened for visitors. Among the guests invited to its opening was President Franklin D. Roosevelt, and although he was unable to attend he wrote a letter in which he said, “You have made a real contribution to the history of the nation”(See picture of letter). In 1970 the Dey Mansion was entered into the New Jersey Register of Historic Places as well as the National Register of Historic Places. As of 1987 the Dey Mansion has been open to the public as a Museum. 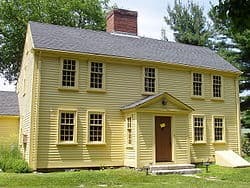 It also acts as a meeting place and reenactment center for many historic groups such as the Hester-Schuyler-Colfax Chapter, Daughters of the American Revolution and the Sons of the American Revolution. The New Jesery Militia/Heard’s Brigade also sponsors annual events at the Dey Mansion in February, October, and December.